Gimme Shelter Animal Rescue is a registered 501(c)(3) nonprofit organization based out of Long Island, New York. Founded in 2011 by Michelle Neufeld Montak and voted BEST RESCUE in The Hamptons in 2012, 2013 and 2014, our mission is to rescue as many animals as possible from high kill shelters and other neglectful situations across the country. Every animal we rescue gets spayed/neutered, vaccinated and microchipped, as well as receives any additional necessary medical treatment prior to being adopted out through our very successful foster and adoption program in New York. We are passionate about our work and dedicate our lives to saving as many wonderful animals as we possibly can. Michelle has devoted the past 5 years of her life full-time to rescuing animals from high kill shelters and other unbearable living situations across the country. She works tirelessly to ensure the health and safety of each animal, as well as to find the perfect forever home, where every single dog will be loved and cherished as a new furry family member. Her experience includes the rescue and adoption of over 2,000 animals to date from high-kill facilities across the country. 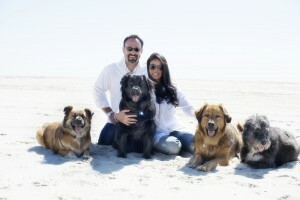 Michelle lives in Sagaponack, NY with her husband Edward and their 5 dogs…Otis, Lulu, Breaker, Donni and Delia.